"It's formulaic, too, but definitely serviceable as a no-brainer action flick." Director Martin Campbell (who you may remember from such films as Golden Eye, No Escape (with Ray Liotta! ), and Beyond Borders (the Masked Reviewer would like to cross Angelina Jolie's borders...), as well as The Mask of Zorro) takes the helm again for the sequel to his remake of a sequel. Martin Campbell has gotten a fair bit of press because he'll be heading up the next film in the James Bond franchise, too, Casino Royale. If you didn't see The Mask of Zorro, don't worry...you won't be lost. Here's what you need to know: Antonio Banderas plays Zorro. Catherine Zeta-Jones (how come it's not "Zeta-Jones-Douglas"?) plays Mrs. Zorro. They've got a kid. They do good. They stop bad men from oppressing people and stuff. The notable no-show in the sequel is Anthony Hopkins, who played...uh...Old Zorro...in the first movie. First generation Zorro? Original Zorro? Zorro Classic? Who knows? Anyway, there's no reference made to him at all in this sequel. That's okay, he's probably too busy working on Bad Company 2 or another Hannibal Lecter movie. Or maybe it's because he died off in the first one. There's also some kid that plays Zorro's son, Zorro Jr. Zorrito? He's a little rapscallion, that one. Always getting into trouble. He doesn't know his dad is Zorro, but he inherited the hatred of oppression and the ability to do unnecessary back flips in fight scenes...keep the tradition alive! But the big question is: is Zorro a Snore-O? When it comes out on DVD should you rush out to buy it at the Store-O? Is it so funny that you'll laugh so hard you'll fall out of your seat and onto the Floor-O? Will you be glad when it's over, or begging for More-O? The film leaps right into some action. The action is good at times, and there are a few cool moves. This time around he uses his whip...although only as a means of getting around. Much like Devo, he whipped it real good. There were of course a couple of totally implausible scenes involving the whip (Miracle Whips), but the Masked Reviewer can forgive that. He had the chance to use it on a dog (could've been a Wippet), but he didn't. He never used it on his uppity kid, either (whipper-snapper). And, lastly, Zorro never hurt his neck by turning his head too fast when he whipped to the side (whiplash). There. That covers the whip. Oh wait, he also used the whip whenever his wife told him to, because he was...well...you figure it out. The biggest difference in tone between Mask and Legend is comedy. This film tries to be much funnier, and it tries a bit too hard in the beginning. Some of the comedic situations aren't well executed, but they do get better as the film goes on. In fact, the movie does get better as it goes on in every respect, which is certainly better than the alternative. As the previews show, the climax of the film takes place on a train...will the movie be a metaphorical train wreck? Fortunately, no, it's saved at the end. Much of the comedy revolves around the drunken jealous rantings of Antonio Banderas. The rest of the laughs come from his horse. Yes, the horse is the comic relief. It's contrived at first, but the horse does steal the show in a couple of scenes. The story itself is rather silly and implausible...it may remind you of the unnecessarily convoluted Once Upon a Time in Mexico, partly because both were set in Mexico, partly because both starred Antonio Banderas, but mostly because, as previously mentioned in this sentence, both were unnecessarily convoluted. Not that there's anything wrong with being unnecessarily convoluted. If you weren't a big fan of unnecessarily convoluted things, you wouldn't be reading the Masked Reviewer's reviews. 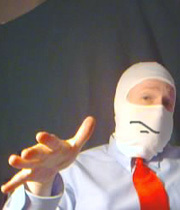 But the Masked Reviewer digresses. There's an awful lot of talking and not nearly as much action as you might expect. It's formulaic, too, but definitely serviceable as a no-brainer action flick. Catherine Zeta-Jones is beautiful, though there are no particularly titillating moments. If you're an Antonio Banderas fan, you'll get to see him on screen, but Little Antonio does not make an appearance. The music is good, but familiar. The effects are sometimes noticeably fake...such as digitally rendered fire. Okay, sure, they're not really going to have a baby lying on a plank with real flames lapping up at it, but it could've used a bit more effort on the realism front. Speaking of realism (or lack thereof)...even though it's set in 1850, there aren't very many characters that pack pistols. A couple do, but most are still running around with swords. Sure, Zorro would have a tough time against a guy with a gun, but it did seem anachronistic. The Legend of Zorro falls somewhere between being average and slightly above average. The execution is pretty good, even though the parts are nothing special. It's nice to see a cool new move or some variation on a tired theme, but there's not enough that's fresh in it to make it something the Masked Reviewer would readily recommend. If you're a huge fan of Zorro, this will definitely be up your alley. As an action film, it's certainly okay, but uneven. It does get better, but even if it had maintained its best moments all the way through, it would still only be pretty good. Expectation from the Title: The true life story about the rarely mentioned fifth Marx Brother. Mother's Rule (Always Say Something Good About Everything): Antonio Banderas and Catherine Zeta-Jones would make a lovely couple, but she should tell him that she's not really Mexican. The Pros: Some amusing moments, a couple of good fight moments. The Cons: Not nearly enough action, too talk, uneven, slow first half. Convoluted. Antonnio Banderas, Katherine Zeta Jones, Mask of Zorro, Joacim, Legend of Zoro, all right here.